Today we have some news from Chernobyl, the place of the Soviet Nuclear disaster. The first one is about giang fishes nowadays can be found in the rivers of Chernobyl. Lately people all the time witness them, and Chernobyl travel trips now include special bus stops on the bridges to make photos of those puppies. They have been reported to reach 3-4 meteres long (10-13 feet). Many stories now being told about the military diver that lost his hand thanks to one of those and some other horrifying tales. People say that the bottom mud is still radioactive in Chernobyl rivers which allows these fish get that size. Here is another video, bit less quality, but still can be seen the contours to guess their size. The “food” they get from the spectators is usually the big pieces of loaf, so the real size of the fish can be understood in comparison. 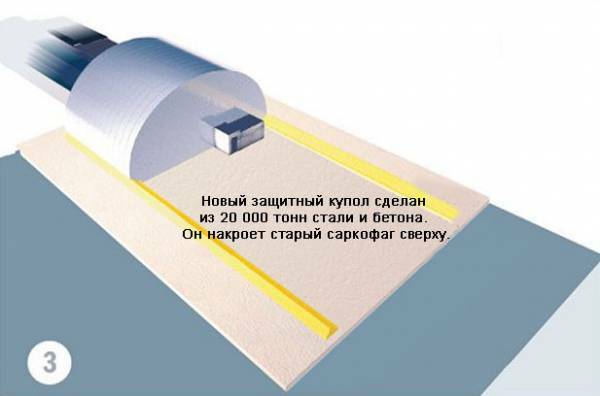 The next story is about new giant dome being constructed above the central point of the Chernobyl site – the reactor. The dome would be assembled at side, in order not to risk lifes of the construction workers participating, and then would be moved on rails like a rolling door to seal this friend forever. 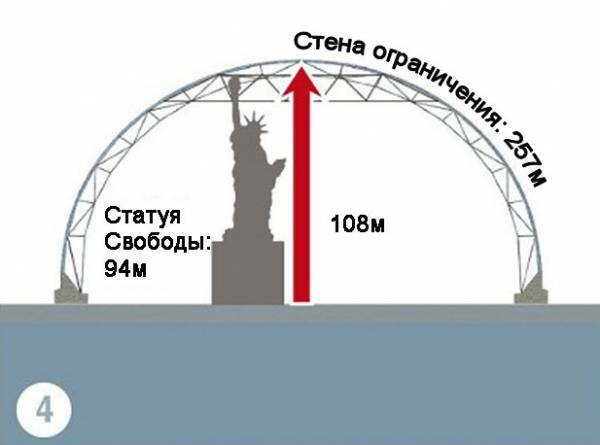 They tell it would be really huge, 108 meteres (300 ft) tall and would be taller than Liberty Statue. Some Russian people make jokes that this nuclear shield is looking nice above the Liberty Statue, meaning that the atomic disaster in New York might have a chance too. They say it would weigh 20,000 tons. 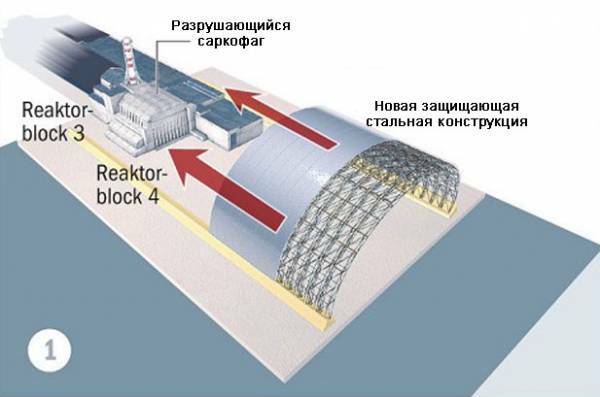 And that’s how the place and the reactor looks like, while the Big Shield project is not yet carried out. They say the radiation is pretty considerable in that place even now. One can hear the sound of crick-cracking monitors turned on. As you can see this place is pretty popular among tourists, some companies specialize on such kind of tourism. And in the Baltic States they apparently don’t know which country they belong to, so they post twice with each time another country name. Eu não sabia que podiam fazer visitaaaaaas a chernobyl depois do desastre atomico!! o incrivel é que tem peixes vivos!!!! So can you eat that fish? European catfish is very very tasty. You can’t compare with american catfish. It’s the tastiest fish out there. Looks like a mekong catfish. They’re all that size. Wels Catfish that big are not uncommon at all, even in healthy environments. My grandfather used to catch catfish like this in Pripyat river nearby (before Chernobyl accident of course), so there is nothing extraordinary here. Catfish managed to grow to this size just because there are no so many fishers/poachers in that area anymore. DO NOT LOOK AT THE TRANSLATIONS SUCH AS THE JOKE ABOUT THE LIBERTY STATUE, THIS IS COMMENTED IN A DUMB AND CONFUSING WAY. RUSSIANS DO NOT DREAM OF NUCLEAR DISASTERS AND COLD WARS, THEY DREAM OF ECONOMIC RECONSTRUCTION AND BETTER FAMILY WELFARE. STEREOTYPES AGAIN, WE HAVE ALOT OF STEREOTYPES ABOUT AMERICANS TOO. yes Russians do dream of good fortune and prosperity but no action. 99% dreams, no result. They do not try to get government that really represents their interests but government [like now] that 90% works for itself and its network. Talk about prestige and patriotism but government just want power and more power. To keep ordinary people down and small and poor and afraid: is their goal. Try doing business in Russia it is maybe worst country in the world to do business like starting shop. Almost no small and medium sized businesses in Russia [read: poor man’s business] only big business with lot of connections and power and large network for bribes and more power gathering. Simple people [99%] have no chance here. Dream on Russia!!! But actually it is time to put foot down and demand more rights and freedom !!!!!! I believe that the greatest detriment to wildlife is the encroachment of man on their habitat. According to some reports, the animals (and presumably fish) are thriving in the Chernobyl area because radiation is less harmful to them than humans. So … I guess there’ll be no glow-in-the-dark caviar! 3-4 meters… LMAO. Come on why do you always have to say bullsh!ts in your “descriptions”?! Just catfish. Catfish get that big if left alone. I personally have caught some over a 3′ long (~1 meter). I would guess that since everyone’s left he area, the fish are no longer being fished, so they are having a chance to grow big. And as for radiation from the mud? Radiation does not travel much in water, so I’d guess that it’s not an issue, unless there’s a lot of radioactive matter stirred up for them to swallow. And that would most likely just cause them to have cancer. Chernobyl is not in RUSSIA!!! It is in Ukraine and this is a big diference!!! The sizes of those fishes are normal…There are no fishermans so they can grow to big sizes…And turists feed them so it is NORMAL!!! 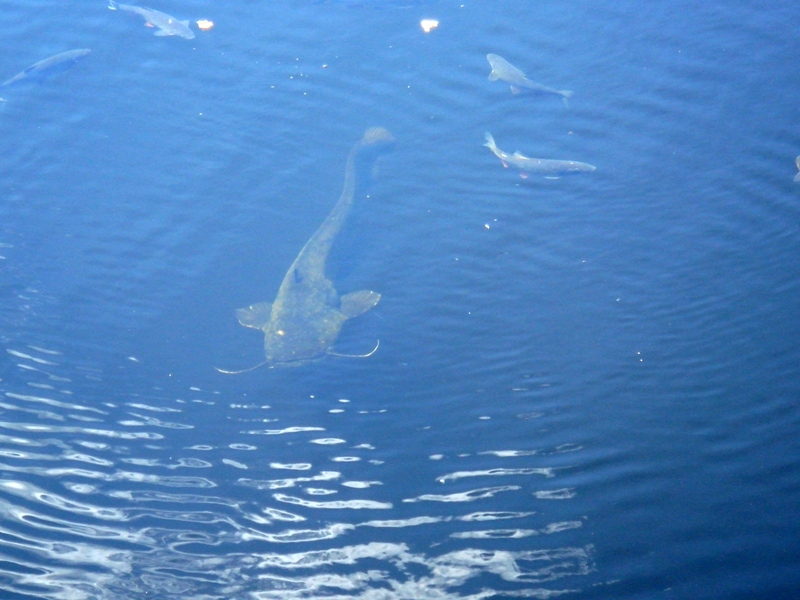 Come on, it’s nothing more than just an old good catfish… yes, they’re really huge, up to 3 meters and more. It’s plenty of them in the rivers of Russia. Can I go with you next year? I was there 3 years ago. The catfish grow to that size because of people feeding them and the lack of predators. It has nothing to do with radiation, though contamination levels may indeed be high in the cooling pond. Just to point out, when it comes to shielding things from radiation, water does an excellent job. We even have varieties of catfish this big in the states.. It’s really no big deal. Verry common to see this around dams where people arent allowed to fish. Its cat fish! They get that big on a normal scale, they get even bigger. Radiation has nothing to do with this. Infact it would kill them. Yea, these look like typical European catfish. Its flesh is considered a delicacy and I am pretty sure that fishing and pollution drove this fish into near extinction in most rivers during the Soviet times. But now that no one lives or fishes in Chernobyl, these fish had an opportunity to become numerous again. I think they are wonderfull. This construction must be finalized at this time. There is nothing special in this.. These are regular catfishes..The only strange thing is that they can be seen very well. Usually they wait hidden in the mud. There were some longer (1-2 centimeters) ones but this is still the biggest one because of its weight. Start fixing those saddles Chernobyl. Perhaps we could race in some years? European Catfish, get together, join the race. any comments about other interesting things noticed in the videos and the rest of the pages? was that 0.640 in Milirem or REM? what is the safest distance before acute effects are noticed? has anyone tested the fish? maybe all this is hype generated by more governing officials that don’t want anyone spying around and seeing what they are really doing in there now. a shield is going to do what? save the people and reduce the security work force in years to come? let us see how many workers for a short period to build it verses how many jobs lost in the future. and keep your political views on politic pages. peace don’t have a chance if you don’t give it one! I too am more interested in the reading on the survey meter. Is it .6 rem (600mr)? Or is it in SI (Sieverts – I hope not – much worse. 1SI = 100 rem). Either way I would not want to be standing even in a 600 mr area. I have a lifetime exposure of 20,000+ mr from working in nuclear plants when younger. I am going to guess that this lake was stocked a few years after the event occurred to maintain the lake and that most likely any fish that was in the lake at the time of the event most likely were irradiated to death. For siluriformes(catfish)to grow to that size is not uncommon but, what is the amount of them in one lake which suggest overstocking and an overabundant food supply. Move to the USA, less communism here. Catfish is nasty tasting no matter what. just wanted to say great blog. Have enjoyed your article very much and benefited from the information. Thank You. What a wonderful place to vacation. I can’t wait to glow in the dark.